So, to make Peter happy and to impress his boss, I looked for 600 thread-count sheets the next time I was at the store. I bought a set of 500 thread-count sheets instead because I liked the color, design, and brand better than the 600 thread-count ones. I folded up our old sheets and put them in the closet; they were now consigned to be the understudies (sigh). When I put the new sheets on the bed I had to admit that they looked invitingly good. They were 100% supima cotton and had a nice sheen to them. But they felt too crisp the first few nights of sleeping on them, even though I'd pre-washed them. The old sheets were better. After those first few nights, however, the new sheets got really comfortable. 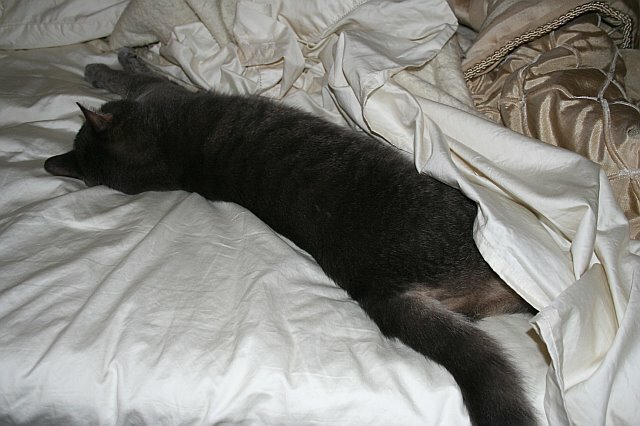 I'm not sure what happened, but I guess the magic of high thread-count sheets kicked in. Now I understand better what the big deal is. I fall asleep faster at night because they feel wonderful bundled up all softly around me. Still, they've proven to be a bit of a liability--even with a solid 7-8 hours of sleep, it's harder to get up in the morning because the bed feels way too comfortable and cozy. But that is a liability that I think I can live with! Brody approves of the new sheets too. I found him like this the day after we got them.